Having recently lost one of my own in similar circumstances, I can only imagine how this loss was felt. Praying that healing and comfort has helped this community and the family and friends of this officer to move forward and remember Deputy Geer. God bless you all! My wishes go out to the family who lost this loved He is in a better home now just like the other fallen officers God bless you. Godspeed deputy. God has a special place for heros. Watch over your loving family while you are there. Today, I ran a hero's 5k in your Honor Sir. YOU are not forgotten. This makes me so angry. Another Wonderful Hero taken too soon. My thoughts and Prayers to your Family and Friends. You will never be forgotten. Thank you for your service. God Bless. My his soul rest in peace, and may God bless his family. On behalf of my family, I extend our sincerest condolences on the grievous loss you suffered when Derek was killed. To the Geer family, fellow deputies, and all who call Derek beloved, my heart goes out to all of you and may you find comfort in your loved ones and your strength in your faith. When my son was killed, the entire law enforcement community in our area embraced us in a circle of love and support, and I know you will receive the same support. It makes the unbearable less torturous, and I pray for your solace. This reflection is sent with the utmost respect for the dedicated service Deputy Geer gave to his community and the citizens of Colorado, and for the supreme sacrifice he and his family made on February 8, 2016. My sincere condolences to the family and colleagues of Deputy Geer. At 1 John 5:19 the bible tells us that "the whole world is lying in the power of the wicked one." Many in this terrible world turn to violence towards innocent bystanders, even those that serve as LEO's. Jehovah God has outlined a wonderful hope and future for those that have fallen asleep in death. Revelation 21:4 reads "he will wipe out every tear from their eyes, and death will be no more. Neither will mourning nor outcry nor pain be anymore. The former things have passed away." I pray that God's promise brings some comfort to the Deputy Geer's family and friends. May both your blood and blue family be comforted. and may He grant you eternal rest and have His perpetual light shine upon you. My family would like to extend our sincere condolences to the family, friends, and fellow co-workers of Deputy Sheriff Derek Geer during this very difficult time. You're in our thoughts and prayers. May they find comfort and support from those around them. May God help heal their aching hearts. Rest in peace, Deputy Sheriff Derek Geer. 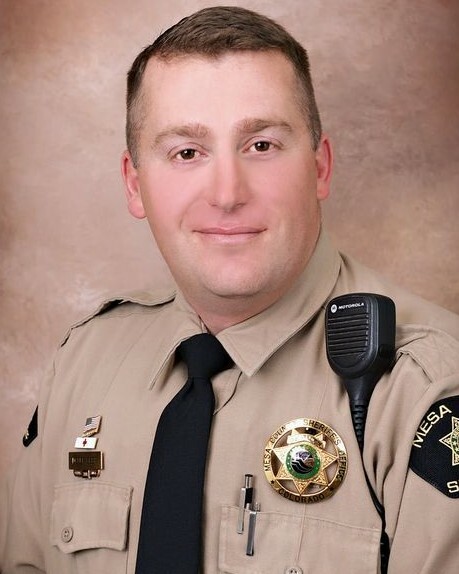 A second Condolence for Mesa County Sheriff's Office & one for Derek's Family , Friends, Community & Country. Thank you Derek for your Brave & Unselfish Service. RIP Derek Son of Valor, with Honor. So sorry to hear of Patrick's passing. May the God Of Pesce & Comfort be near All who knew & loved Patrick. My family sends heartfelt Condolences to Family , Friends, Department, Community, & Country. Thank you Patrick for your Brave & Unselfish Service. RIP Patrick, Son of Valor , with Honor. Such needless deaths make me so sad. Our hearts break each time a officer is taken from us this way. Please accept my heartfelt sorrow for you loss. May he always be remembered by all citizens for his duty and selfless acts to defend our lives. Rest in Peace Deputy Sheriff Derek Geer. Thank you for your service to this country and your community. My thoughts and prayers are with your family and your department at this time. To the family of Deputy Sheriff Derek Geer, friends, Sheriff Matt Lewis and the Mesa County Sheriff's Office. Thank you for years of service to the citizens of Mesa County and your brothers & sisters in law enforcement. I'll always fondly remember spending time with you on calls, and all the times we talked on the phone and hung out in between calls over the years. To those who didn't know Derek, he really was a nice guy. I know it's appropriate to say that about anyone who has fallen, but Derek never let the negatives of the job get to him. He always had a smile and a laugh to share, and I don't recall ever seeing him angry about anything, even on the bad days that we all have. A rare breed in this tough profession, and a sad loss for our agency and community. Until we meet again, rest in peace brother and friend.